Have you ever lost hours watching Antiques Roadshow marathons? Or do you lead a substantially more exciting life than I do? I can’t help it; there’s something so compelling about finding treasures in your attic. That ashtray is really a Civil War-era candy dish! That punch bowl is really a 12th-Century chamber pot (we sincerely hope you washed it first)! Even though the most exciting thing I ever found in my attic is a dead squirrel, it’s fun to dream. Think of your existing content library as one big, overstuffed attic. All the great stuff your team has written is still there. It may occasionally attract a visitor or two, but for the most part it’s just collecting virtual dust. So why are we in a constant mad dash to create new content? For most organizations, there is plenty of value left in the old stuff. With the right repurposing, content that proved valuable to your audience once can attract a new wave of traffic. Repurposing your old content isn’t a lazy or cheap move. Odds are your audience has grown since you first posted it. And many might have missed your first round of amplification. Still others didn’t read the blog post, but would be eager to consume the content in another format. In short, if a post is still relevant and valuable to your audience, it’s just as much a treasure as that ancient chamber pot/punch bowl. Here are five ways to take your treasures out of the attic and on to the roadshow. Every once in a while, we marketers get a lightning-strike of a post. Sometimes we even do it on purpose. We write something so useful, so comprehensive, so definitive that it stays relevant and attracts traffic for years. That’s evergreen content, and it couldn’t be easier to repurpose it: just post it again on all of your social media channels. Many marketers feel guilty about reposting, or worry about boring their audience with reruns. But the hard truth of social media is you only reach a fraction of your audience with any given post. And the hard truth about your audience is they most likely haven’t read every post on your blog. So there’s a vast untapped market of people who have no idea this great resource existed and would be happy to hear about it. Pull a few stats and quotes from the piece, make some eye-catching social media images in Canva, and share away. Just below the evergreen content in ease-of-repurposing are posts that were popular when first posted, but have lost relevance over the months and years since. They may have old statistics, broken links, or embarrassingly outdated pop culture references (Gangnam Style, Harlem Shake videos, etc). Still, it’s far simpler to refresh these pieces than create something from scratch. Add new visuals. Get up-to-date stats. Add a section on new developments. Remove the Ice Bucket Challenge reference. When you’re done, you will have a like-new piece with a fraction of the work, all ready to provide value to a new audience. Let’s face it: Most organizations got into some shady business when SEO-driven content first became a thing. Back when it was all about quantity, we might have put out five shallow 300-word posts instead of a deep 1500-word one. Or we might have posted the exact same ten tips in three different posts, with slightly different keyword stuffing. It’s okay. We all have our embarrassing phases. But it’s time to polish up that thin and repetitive content. Google is watching, and the quality of content on your site will affect your ranking, for better or for worse. So get rid of repetitive content, making sure to 301 redirect to the one version you plan to keep. Then take your thin content and combine it, Voltron-style, into one strong Power Page. This is a good opportunity to polish and refresh, too. Not only will you avoid taking a hit for thin content, your new page can be a powerful force to pull you up in the rankings. Have you heard that nobody reads anything anymore? Okay, that may be an overstatement. You’re still reading, right? At least, you’ve read this far. Thanks for that. Anyway, while people haven’t entirely given up on the printed word, turning text into visuals is a surefire way to earn attention from a new audience. There are plenty of ways to go visual with old content. You can create a SlideShare that delivers your key points with well-designed flair. Pull out a few key paragraphs and make a short video out of them. Turn a how-to article into an infographic or a flow chart. Use the post as a jumping-off point for a podcast. Whichever way you go, you’ll be reaching out to an audience that might not have engaged with plain old text. When the first Star Wars movie came out in 1977, it was just called “Star Wars.” It wasn’t until it made roughly seven hojillion dollars (adjusted for inflation) that it became “Star Wars Episode IV: A New Hope.” There’s a lesson in that for marketers, and it’s not just to be mindful of the living Force when you create content. Say you wrote an article on Civil War candy dishes that your audience really enjoyed. After a few months, when the traffic to that article has slowed, write a new piece on Revolutionary War candy dishes, using the same basic format as the first piece. Add an editor’s note to each post explaining they’re part of your Candy Dishes of Conflict series, and link to the first post from the new one. You can drive new traffic to the old post, and encourage people to spend more time on your site by making sure each post links to the entire series. 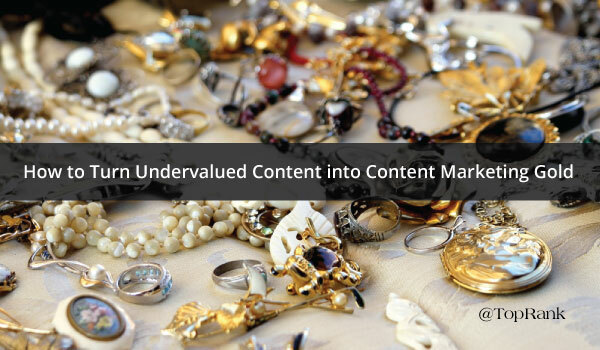 There’s a good chance that content your audience found valuable in the past still has value for you and your readers. Some pieces may be good-to-go as-is; some will require varying degrees of dusting and polishing to show their worth. Whether you’re reposting, refurbishing, or transforming it, repurposed content can fill holes in your editorial calendar and keep your audience engaged. Super topic Joshua. As marketers, we always have to be thinking about how to get more mileage out of our limited resources; and repurposing content is a great way to do that. I find your “Combine Thin or Repetitive Content” suggestion very interesting. Combining thin content is something our SEO specialists have been bullish on. It really can help boost rankings. Thanks for reading and retweeting–I’m a big fan of Curata, especially Pawan’s contributions to LinkedIn Marketing’s various projects. You guys know your stuff–if I managed to tell you something interesting or new, that’s a big deal :-). I enjoyed this list of repurposing techniques, and use most of them with my clients. Ha! I suppose so. Although TV marathons tend to feature less refreshing and transformation. I would definitely watch a “refreshed” episode of Antiques Roadshow, where they ended the episode with updates on what happened after the show. Did they sell the chamber pot? Did they stop using it as a punch bowl, at least? Nice post, Joshua. It’s good to know we can get more mileage from our posts. I often re-post older material; I haven’t yet converted any into different formats That’s something I need to get on to.